The creators behind Mega Man Legends 3 want you to design one of the game's mecha. Before Keiji Inafune's departure from Capcom, he revealed that the company would be giving players a chance to influence the design of the upcoming Mega Man Legends 3 for the Nintendo 3DS. The process started with a poll that asked the common folk to choose the game's heroine, but the second initiative will be somewhat more hands-on. Now, Capcom needs your mecha design ideas. A post in the Mega Man Legends 3 Dev Room has detailed the process through which one enterprising mecha designer can get his/her name in the game's credits. The initiative is decidedly more involved than the choice of a heroine, which was a simple vote. This time, Capcom has posted various documents which designers must follow to create the ideal mecha for a particular situation in Legends 3. The mecha is one built by the Bonne family, from which you may know Tron Bonne whom has been featured in the Marvel vs. Capcom series and previous Mega Man Legends titles. 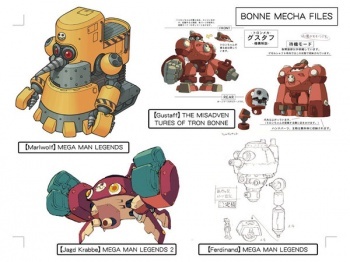 Graphics of other Bonne mecha are shown as style guidelines, while Capcom also put up a casual design discussion between Legends 3's designers for the mecha's premise within the storyline, in addition to a synopsis of the Bonne family history and details on those wonderful Servbots. The Dev Room post is a translation of one from the game's Japanese Dev Room, but fans from other regions will presumably be able to upload their mecha ideas soon. If you've got an artistic streak, get to work, because you could get your name in videogame lights alongside the talent working on the next big Mega Man title.